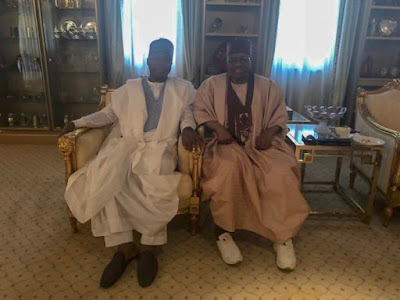 Senate President Bukola Saraki on Friday avoided journalists after holding a private meeting with the former Military President Ibrahim Babangida at his hilltop mansion in Minna, Niger state. The News Agency of Nigeria ( NAN) reports that Sen. Saraki arrived IBB’s residence at about 4.10p.m.and left at 5.50 p.m. for Minna international Airport, shunning journalists who wanted to interview him. NAN reports that Saraki drove straight to the hilltop home of the former military ruler in a convoy of nine vehicles. Saraki’s visit followed a press conference he addressed at the National Assembly, in the wake of the blockade of the National Assembly gates by operatives of the DSS. In a blistering reaction , Acting President Yemi Osinbajo ruled the blockade as illegal and unauthorised and as a gross violation of constitutional order, rule of law and all accepted notions of law and order. Osinbajo then went further to sack the director-general of the DSS, Lawal Daura, who was appointed by President Muhammadu Buhari in July 2015. On Wednesday, Saraki sidestepped a question on his presidential ambition. On whether or not he would relinquish the position of Senate Presidency which he was ‘given’ under the All Progressives Congress (APC), Saraki stressed that he was not given the position but was elected by members.